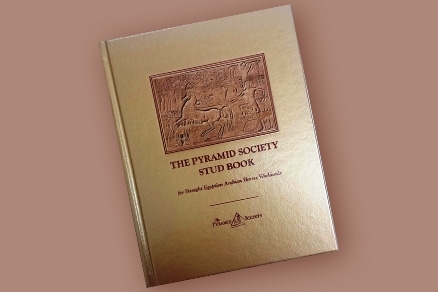 The Pyramid Society offers this publication as the final and definitive chapter in establishing the Straight Egyptian horse as a breed within the Arabian breed. It is to be considered as the only indisputable and unequivocal reference tool for all breeders of the Straight Egyptian Arabian horse worldwide. “The Pyramid Society founders, in establishing the definition of the Straight Egyptian horse, were inspired by the horses bred at the Egyptian Government Stud, Al Zahraa, and set out to preserve and perpetuate their unique qualities so that posterity might benefit,” states Omar Sakr, Chairman of the Stud Book publication and Pyramid Society Board Member. “For close to fifty years this limited genetic pool, carefully selected after much research, survived, prospered and dominated the global Arabian horse scene, remarkably without an official studbook, fulfilling the prophecy of the Pyramid Society founders,” he adds. This prominence over the years is a testament to the imposing and unique qualities of this horse that can never be recreated from other than its own. The Pyramid Society owes a debt of gratitude to Sheikh Khaled Bagedo, owner of Al Khaled Stud, Saudi Arabia, a renowned and dedicated breeder of Straight Egyptian Arabian horses, for his commitment to the Society’s mission as evidenced by his generous sponsorship of this publication. Appreciation and gratitude are also extended to the Egyptian Arabian Horse Pyramids Foundation of Egypt for their support, shared vision and leadership in the endeavor. This studbook reflects the collaborative, tireless research and assembly efforts of Omar Sakr, Judith Forbis, Joe Ferriss, Christie Metz, Keri Wright, Mohamed El Bourini and Ahmed Aboul Fotouh.